lower left in pen and black ink: Jackson Pollock 51. (Robert Elkon Gallery, New York); N. Richard Miller, Philadelphia; (Weintraub Gallery, New York); Ruth Cole Kainen, Washington, D.C.; bequest to NGA, 2012. 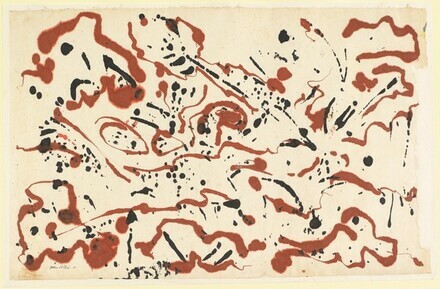 Jackson Pollock: Drawing Into Painting, The Museum of Modern Art Oxford, England; Stadtische Kunsthalle Dûsseldorf, Germany; Gulbenkian Foundation, Lisbon, Portugal; Musée d'Art Moderne de la Ville de Paris, France; Stedlijk Museum, Amsterdam, The Netherlands; The Museum of Modern Art, NY, NY, 1979-1980. O'Connor, Francis Valentine and Eugene Victor Thaw, editors. Jackson Pollock: A Catalogue Raisonne of Paintings, Drawings, and Other Works. 4 vols. New Haven and London: Yale University Press, 1978, 3:291, no. 812. National Gallery of Art. Highlights from the National Gallery of Art, Washington. Washington, 2016: 316, repro.